And we are off to the races! In the last few years I’ve started to explore more Irish whiskies… and am quite impressed with the results of the ‘single pot still’ method that produces the remarkable Redbreast and Yellow Spot. The Tyrconnell 10 year Madeira Cask won the Irish Whiskey of the Year in Jim Murray`s Whisky Bible 2008. So… I was both intrigued and delighted when a friend from the UK included this in my ‘Irish whiskies’ shipment on her trip to India last year. I first shared it with our tasting team on 14 June 2014 together with Ledaig Island and Talisker Dark Storm. Finish – Alas nothing spectacular… a hint of light leather and mild fruit, while it doesn’t dash off instantly, it does not have the long linger some reviewers boast! In our blind tasting session, we speculated that while clearly young, it showed ‘nice’ promise. In my recent revisit, it re-inforced the impression of a light pleasant whiskey. The mood is that of a gentle cantor in a ladies saddle rather than a fast and furious dash to the finish line. While certainly enjoyable, it doesn’t have that extra distinctive and complex character that I find most attractive. Special ‘nod’ to a fab lass who was our delightful ‘mule’! 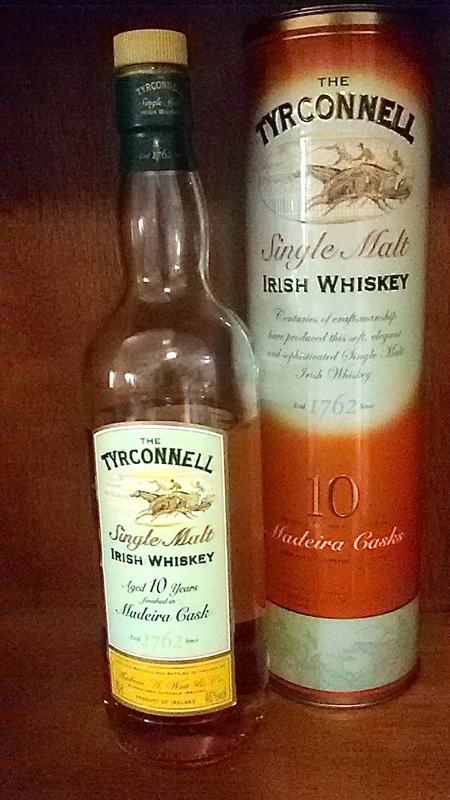 This entry was posted in Beyond Scotland, Ireland and tagged Irish whiskey, Irish whiskies, Madeira, Madeira Casks, Tyrconnell, Tyrconnell 10 year Madeira Cask by Carissa Hickling. Bookmark the permalink.